The Nelson Block was completely refurbished in 2008/9. The upper floors are now offices, flats and storage. The library is used for meetings but the books have been removed and the dormitory fittings are also all long gone. After many years of negotiation on behalf of the Friends Captain David Nutman MNI (50-51) secured agreement that our old mess-deck in the Nelson Block would be redesigned as a themed HMS Conway Coffee Shop. The coffee shop was formally opened by Captain David Smith OBE RN (42-44) at 11am on Sunday 29th March 2009. It contained a number off information boards, old photos on a rolling computer display, bunting spelling out the motto, a replicas of the ship’s stern name board, ensigns and a knot tying board for children. 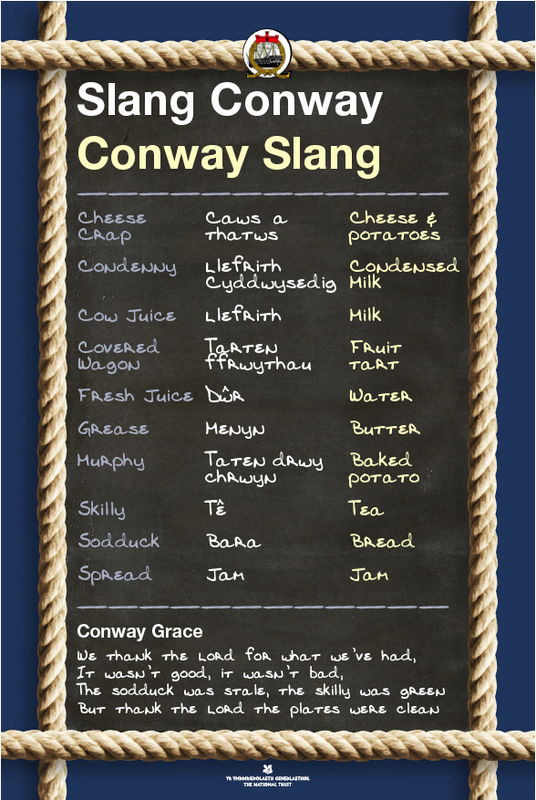 One of the most popular items was a menu board listing the cafe’s menu using Conway sa;mng. Staff quickly got used to orders for cheese craps and skilly. A series of photos of the information boards, the room and the opening here Newspaper coverage of there opening is here. It remained as the Conway Coffee shop until 2015 when it was returned to its main use as a second hand book shop. However all the information boards and artifacts were moved into the old Quarterdeck space where they remain and actually make a much more striking Conway display.